Adenosine triphosphate (ATP) molecules are reduced and then regenerated constantly to facilitate skeletal muscle contractions. The amount of ATP that goes through this process is astonishing. David Costill Ph D, estimated that in the running of a marathon, an athlete will reduce and then regenerate, a quantity of ATP molecules equivalent to their full body mass during the race! The energy used to rebuild ATP comes mainly from carbohydrate and fatty acids molecules (food) that themselves catabolize, and the resulting energy release is captured to rebuild ATP, but will the ATP still regenerate with an oxygen deficit? Unfortunately, this energy transfer process is only about 25% efficient, which means most of the energy released in nutrient catabolism is lost as heat and not ATP regeneration. Endurance events in track and field are characterized by having both an aerobic energy system and an anaerobic energy system contribution to the regeneration of ATP molecules during maximum effort. The contribution of each system is chiefly dictated by the duration of the race. Longer endurance races have a greater aerobic energy system contribution than shorter races do. Each endurance event will demand a certain level of aerobic energy contribution; i.e., the oxygen demands of the event that can be met by the cardio-respiratory and the muscular system aerobically, in order to be successful. The oxygen demand that cannot be met by the aerobic system must be met with the anaerobic energy system. This level of intensity will be faster than the lactate threshold and will accumulate varying levels of disassociated lactic acid, thus increasing the acidity of active muscle tissue. The levels of increased acidity caused by exceeding the lactate threshold may be referred to as oxygen deficit (debit). This physiological concept, well known to endurance coaches, can be defined as: The amount of additional oxygen required by muscle tissue to oxidize disassociated lactic acid, while regenerating both depleted ATP and PCr (creatine phosphate) molecules following vigorous exercise. Physiologist A.V. Hill, working at Kings College in London in the 1920’s, developed the theory of oxygen delivery variability at the skeletal muscle tissue level as being the main limiting factor in human endurance performance. Because oxygen needs and oxygen supply differ during the transition from rest to exercise, the body incurs an oxygen deficit as shown in Figure 1, even with low levels of exercise. The oxygen deficit is calculated simply as the difference between the oxygen required for a given rate of work (steady state) and the oxygen actually consumed. Despite insufficient oxygen, skeletal muscles still generate the ATP needed through anaerobic pathways (Wilmore and Costill 2004). During the initial minutes of recovery, even though the muscles are no longer actively working, oxygen demand does not immediately decrease. Instead, oxygen consumption remains elevated temporarily (Figure 1.). This consumption, which exceeds that usually required when at rest, is now known more commonly as: excess postexercise oxygen consumption (EPOC). 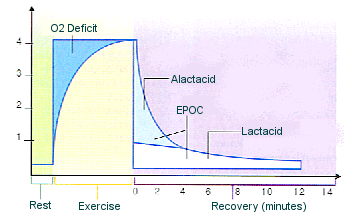 The EPOC curve has been described as having two distinct components, an initial fast component (alactacid) and a secondary slow component (lactacid) (Astrand 2003). According to classical theory, the fast component of the deficit curve represents the oxygen required to regenerate ATP and PCr used during exercise. The slow component of the curve is thought to result from the removal of accumulated lactate from the tissues. Later studies have shown this to be true, but too simplistic. Essentially, the EPOC theory does not account for oxygen borrowed from myoglobin and hemoglobin and high body temperatures which utilize more oxygen to maintain (Wilmore and Costill 2004). Figure 1. Oxygen deficit and the EPOC theory curve (Hill 1924). The oxygen deficit levels will be specific to each individual’s physiology (genome and fitness), coupled with the demand of the race distance. Low demand aerobic activities have a short oxygen deficit recovery of less than 20 minutes; while some very high demand anaerobic activities may need a 24 hour recover. The oxygen deficit curve mirrors the timeframe of other recovery curves as well for all recovery principles in the endurance events are intimately linked to oxygen delivery at the skeletal muscle level. Astrand, P. and K. Rodahl. 2003. Textbook of Work Physiology. Human Kinetics Publishing Inc., Champaign, Illinois, USA Pp. 156-162. Willmore, J and D. Costill. 2004. Physiology of Sport and Exercise. Human Kinetics Publishing Inc, Champaign, Illinois, USA. Pp. 142-168.